There were tons of Polaroid Land Cameras produced in the 1970s. And though many of them were made of metal, there were also cheaper models like this Colorpack that were cheap and plastic. These cameras retailed at consumer range prices, and set a precedent for many similar models that followed. These are some of the most common Polaroid cameras that I find at thrift stores and garage sales. And so you can find them for very cheap. Nevertheless, these are nice pieces to own because their soft shape and color can effectively offset harder-looking pieces on your bookshelf. It was produced from 1971 to 1972. This camera uses peel-apart 100-Series Land Pack Films (discontinued) or Fujifilm FP-100C (still manufactured). It was a big seller thanks to its low price (under $30 at time of introduction) and color film capabilities. My favorite part about these cameras is that they have tiny kickstands in front that made them easy to display (or easy to shoot if you plan to actually use them). If you see one of these out at garage sales or thrift stores, makes sure it has this part still attached. They can fall off very easily and it’s almost impossible to properly display them in this conditions. 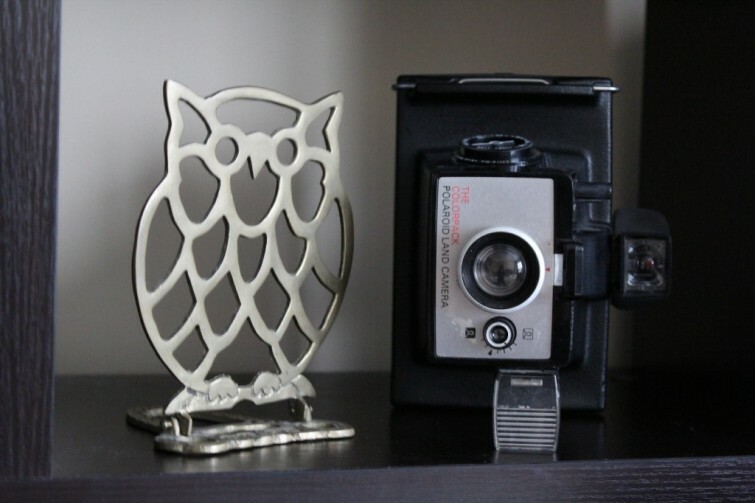 For more information about decorating with vintage cameras, check out my piece on incorporating vintage cameras into a modern living space.